The new Porsche Panamera will be faster and better looking than the current car, Porsche promises. 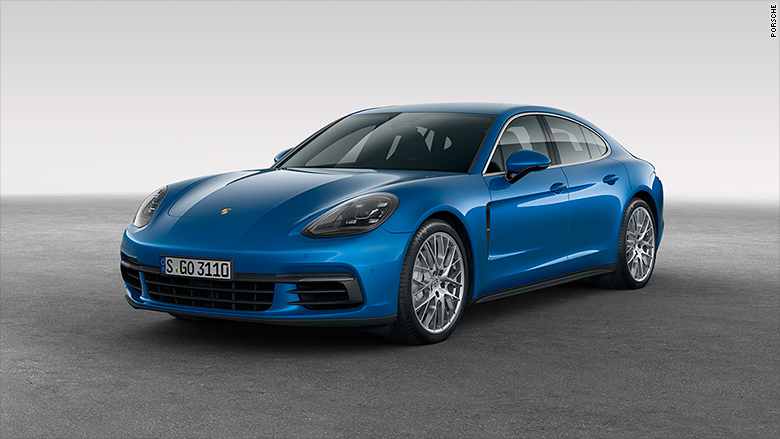 Porsche unveiled an all new, more powerful second-generation Panamera hatchback on Tuesday. The new version of Porsche's four-door car looks more like a sports car and, Porsche promises, will drive more like one, too. The new Porsche Panemera Turbo, which will be the fastest and most expensive version, will be powered by a 550 horsepower turbocharged V8 engine, enabling it to go from zero to 60 miles an hour in as little as 3.4 seconds. Prices for that car will start at just under $150,000. Top speed will be 190 miles an hour. A less expensive Porsche Panamera 4S, with prices starting at about $100,000, will have a 440-horsepower V6 engine. Both cars will be equipped with new eight-speed transmissions and full-time all-wheel-drive. The current Panamera has been criticized for what some call an awkward exterior design. With the new Panamera, Porsche designers accentuated its long body lines but made the car look lower with a roofline that's about 20 millimeters -- over three-quarters of an inch -- lower in the back. 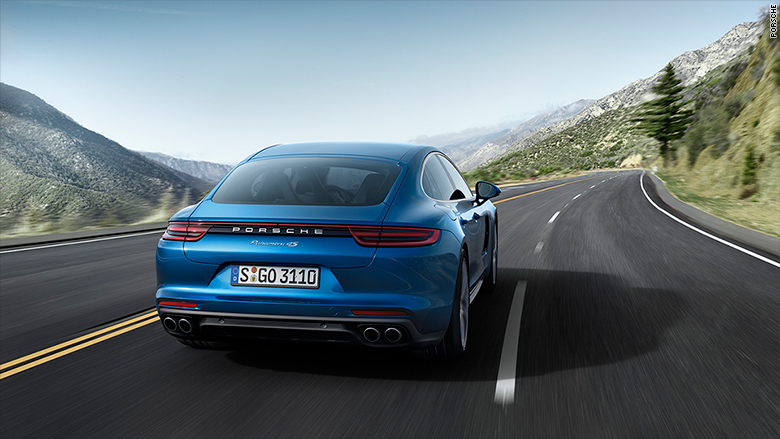 A new rear end design with new taillights makes the car look more closely related to Porsche's famous sports cars such as the 911. The most striking new feature of the Panamera may be its interior, though. 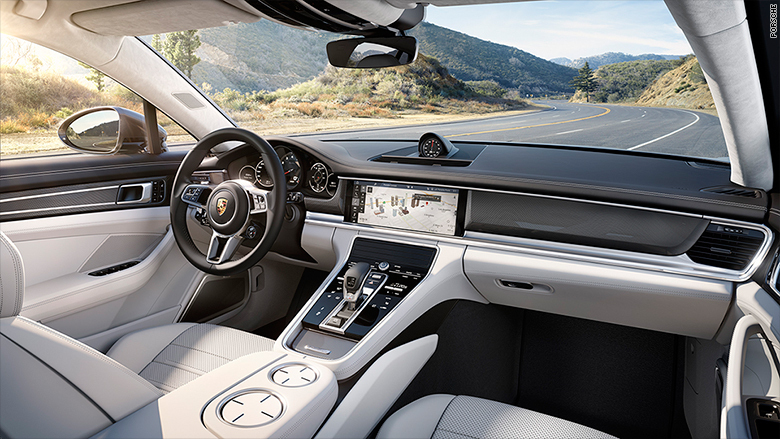 Porsche dashboards and center consoles have tended to be cluttered with rows of buttons and knobs. The Panemera's new interior uses a much larger computer touch screen and touch-sensitive surfaces to give the interior a much cleaner, almost hi-tech, look. Some things are still done the old fashioned way, though. While most of the new Panemera's gauges, such as the speedometer, are now "virtual" dials appearing on computer screens, the tachometer, which displays the engine's speed in revolutions per minute (RPM) remains a large analog dial with a needle. True to Porsche's sports car heritage -- drivers on a race track aren't concerned about speed limits -- the large tachometer occupies the central place in the gauge cluster with the smaller speedometer off to the side. The Panamera is far from Porsche's most popular model. Those are the brand's SUVs, the Macan and Cayenne, and the iconic 911 sports car. 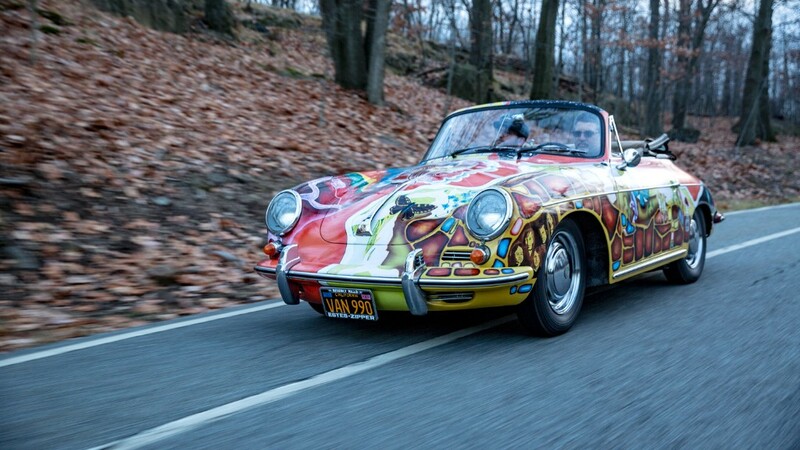 Porsche is part of Germany's Volkswagen Group (VLKPY). The new Panamera is set to go on sale in the United States in January 2017.